Mckinley’s Varin Lenard drives past Hamburg’s Timothy Kane. For the last seven years, either McKinley or Williamsville South has been the Section VI Class A-1 champion in boys basketball. On Saturday, the run will reach eight. Both teams won semifinals Thursday evening to earn a return visit to Buffalo State Saturday for the 6:30 p.m. Class A-1 championship. Williamsville South, as it has done many times over the years, hit big threes and fast-breaked to a big lead over North Tonawanda before winning, 62-49, in the opener. McKinley, as it has done many times over the years, wore its opponent down in a hard-fought, 49-37 victory over Hamburg. Williamsville South won the A-1 title in 2010 and 2011. McKinley won three straight from 2007 to 2009 and will again try to win three straight again on Saturday. “It’s going to be a tough matchup, but we look forward to it,” said McKinley coach Zaire Dorsey. With the starting five of last year’s New York State Public High School Athletic Association Class A champions among the McKinley crowd behind one of the baskets, the Macks grinded back and forth with Hamburg for the first three quarters, with the Macks up just 32-30 headed to the fourth. 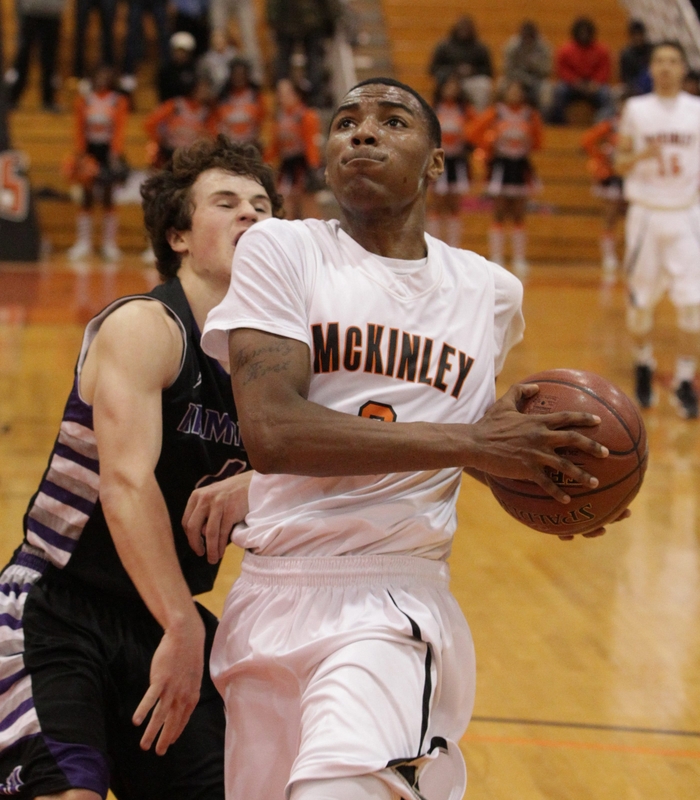 “For the first three quarters I thought we didn’t play McKinley basketball,” said Dorsey. “We weren’t running. The defense was good, but offensively we weren’t patient in running our sets. When that fourth quarter came, we were able to get out in transition a little more. The final quarter began with senior Dante Thompson scoring two straight baskets to give McKinley a boost that it would maintain the rest of the quarter. Thompson had six of his 12 points in the fourth. Soon after, junior Devin Morris, younger brother of last year’s first-team All-Western New York selection Marcus, scored five straight points (of his seven) on a three-point play and a follow-basket and the Macks were up 43-35 in a game which was a one- or two-possession game most of the evening. Senior Varin Lenard had 16 to lead the Macks (14-6), who had 11 players as part of their rotation as it played its usual aggressive defense. Dorsey credited Jeremy Kelley and sophomore Keon Johnson as reserves. “We just threw bodies at their big three,” Dorsey said of Hamburg senior guard Tim Kane (nine points), senior forward Brandon Pierce (14) and senior forward Griffin Ryan (nine). Pierce, who fouled out midway through the fourth quarter, hit a hanging-in-the-air three-pointer at the first-half buzzer to bring Hamburg (11-10) within 20-19. For Williamsville South (12-8), junior Sam Castronova had three three-pointers among his 17 points while sophomores Grant Beyer and Graham Dolan each had 13 points. South hit six of its eight threes in the middle quarters, which it dominated: 14-2 in the second to gain a 33-19 halftime lead; and 16-10 in the third in which its lead was well over 20 before settling to 49-29 heading to the fourth. “We haven’t played with a lead all year, believe it or not,” said South coach Gabe Michael. “We played great. We shared the ball. When we hit shots, we’re tough to beat. The intensity was great. North Tonawanda (14-6) was unsettled offensively during that span; by the time that junior guard Nehemiah Stone (10 of his 18 in the fourth quarter) could help lead a comeback attempt, it was too late. Junior Chris Woodard added 16 points for the Lumberjacks.